I saw this quote on Twitter this morning from Bob Rothman and it is a great encapsulation of what I had planned to write about. With so much talk of paradigm shifts, disruption, new patterns of organisation, so much of what I hear feels a little counterfeit. The reason is that the speakers are not speaking from a place of authenticity, rather it is a case of do what I say and not what I do. While I was working at BT I was sent on a course of media training. This teaches you to really pitch your idea or summarise the points you want to make to a journalist in a very short space of time. 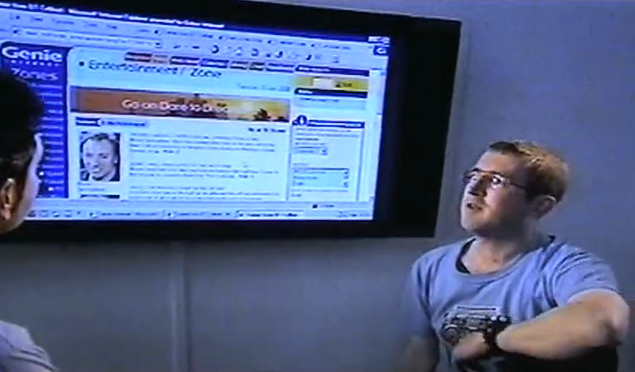 Here is the outcome of this training, from 2000, when I was on Sky News. I wasn’t on TV that much, but in my job I did do various newspaper and magazine articles, which have long since been lost to the world. It’s funny since at Genie Internet, which was a subsidiary of BT Cellnet, we were actually disrupting ourselves, but not ourselves personally, we were disrupting our own core business model by developing a platform and portal which accepted users on any mobile network. This was not a unilaterally popular decision by any means, but we went ahead and did it, experimenting, launching beta services with no fully-developed business case, and developing experimental partnerships with like-minded pioneers in new media. The year 2000 was also a huge turning point in my life, at the age of 30, where I would start a more inward journey of self-development, and journey that still continues to this day. As I like back on my 30 year-old self, I realise that while I do think I have the same essence, I am a little wiser, a little more present, a little more mindful. Living in Brazil has aided this massively, due to the challenges of adapting to a new culture which is far from the world I am used to. It’s not just Brazil of course, anyone moving into a radically different culture will experience the same. But I have been writing a lot on my blog about talking the talk but not quite managing to walk the walk. It is interesting to have conversations with people who are present but not physically speaking to you, as we can say so much without words. Our egos speak volumes not just through body language we do not perceive or gestures we may be overly exaggerated, but also through what is not said. Media training takes place in a very controlled learning environment of course, and while it is a safe learning environment, one of the most painful yet most effective lessons comes not from the theory, but from the simple act of doing something like and interview or press conference which is recorded on video and then shown back to you. You really get to see the ‘ums’ and ‘ahs’ and ‘errs’ and ‘you know?s’ and the way you take so long to express a single and the way you fidget and don’t fully concentrate on the interviewer. It’s no so easy to watch yourself in this way, but sometimes it’s the only way to realise what we do so unconsciously. In a previous article I wrote that “our customer experience fully comes to presence in the customer experience of those who are not our customer”. This is profound, but I am not so sure that so many people actually really get what it means just reading it. There have been times when I would have loved to have had a video recorder, and record not in the controlled spaces of a training class, but out in a natural setting where people are interacting. There are some times when I would just love to show someone the dynamics of their interactions, and really ask if they really understood how their comportment was really being understood, was speaking volumes to those around them. 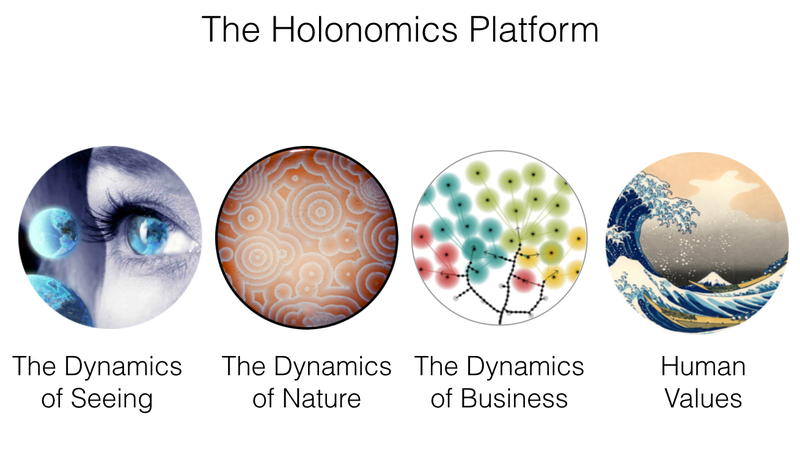 From the perspective of Holonomics all of this comes together in the holonomics platform. The foundation is human values, but sometimes we may think we are practicing human values when in fact we fail to honestly acknowledge our being, how we are, how we really are. The outward manifestation of our behaviours is only a reflection of our inner being, and once we develop a dynamic way of seeing, not just of outer phenomena but of our inner psychological geography, then that is the time when we experience personal revelations of where we may be coming up short, and what we can do about it. There are many ways of being in this world, and the greatest innovators, the greatest leaders and the greatest agents of change understand this, and that their way of being is not the exclusive one or the superior one. It is only by diving deep into our own dynamics of being that we will develop the necessary insights to facilitate the change in the outer world we so desperately seek. Great article Simon. This isn’t something you can teach or even tell people though because it’s something you have to go through and arrive at yourself. I’m connected with a few (self proclaimed) self-help gurus on social media and it always makes me smile when they pose challenging or controversial questions to others but really resist when anyone questions their, often entrenched, views. Becoming open to disruption certainly does involve dropping your ego and that’s much easier said than done! Definitely. Maria and I actually know people such as these. You have to really focus on your own path and self-development and not get too caught up in the counterfeit presentations of others.